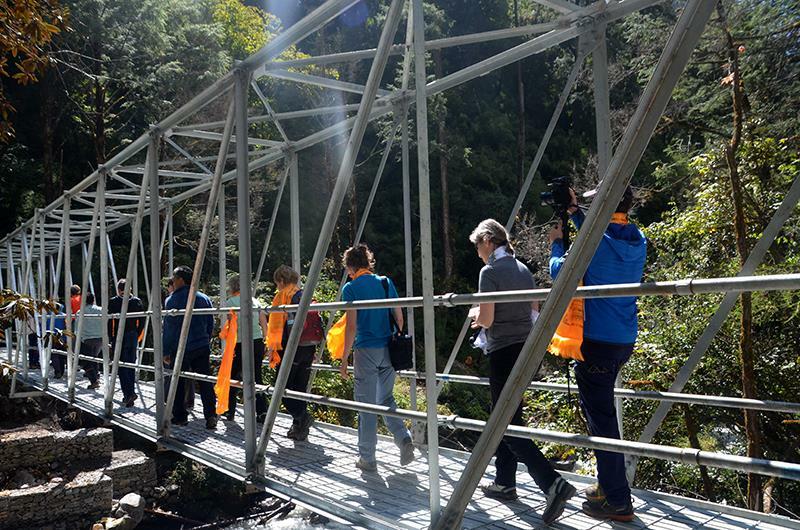 KATHMANDU, Oct 10: Trekking Agencies’ Association of Nepal (TAAN) has completed trekking and transportation trails maintenance and a trail truss bridge installation works under “Restoration of Trekking and Transportation Trial in Langtang Valley Project”. The project was implemented by TAAN in Langtang National park area after the mega earthquake of April 25, 2015 to restore the tourism activities in Langtang valley and its surroundings. The project had received a financial support of 1,00,000 Euros from the donation of members of Deutscher Alpenverein (DAV). Similarly, TAAN also contributed 10 thousand Euros to construct the bridge. The total budget of the project is around 127,00,000 rupees. German Mountain climbers and the German Alpine Club (Deutscher Alpenverein) coordinated efforts to raise donations and to provide development aid in the rebuilding of trails and bridges in the Langtang Valley. The trail truss bridge of total span 32 meters six tones of galvanized iron truss at the altitude of 2854 meter is inaugurated on 4th October 2017 in presence of Vice President of DAV-German Alpine club. 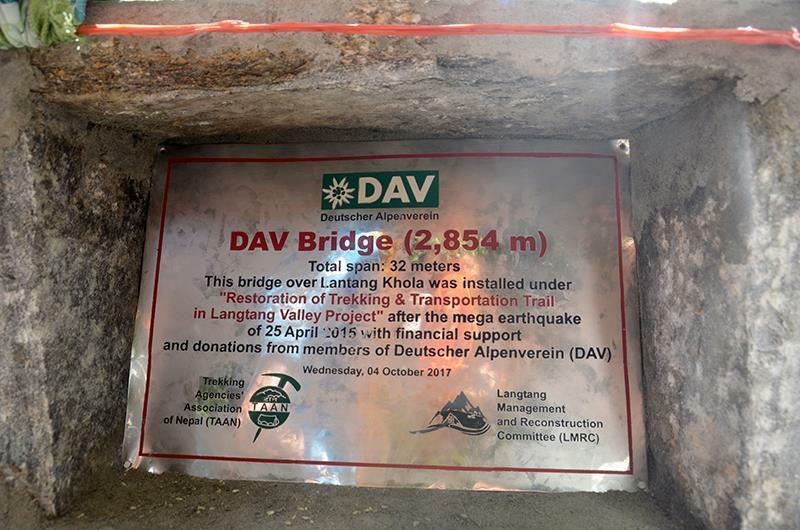 The project was started after signing a tri-party MoU among Langtang Management & Reconstruction Committee (LMRC) – TAAN- DAV, German Alpine Club. The MoU was signed by the TAAN First Vice President Tej Bahadur Gurung, LMRC President Temba Lama and DAV Project leader Gunnar Amor. LMRC supported for all the local management. The project started on December 2016 and was completed on September 2017 as per the plans. The project was divided in five sectors and each of the sectors carried out different activities through their committee for re-construction and maintenance purpose. 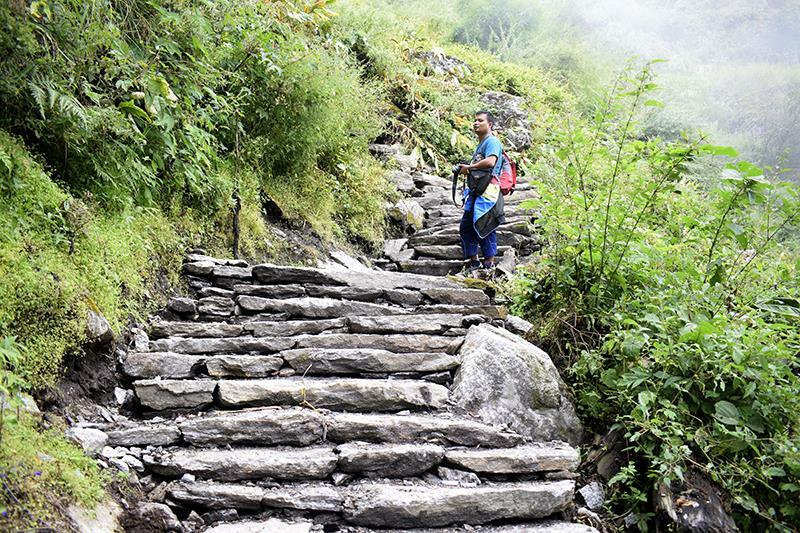 Under the project the trekking trail maintenance, stair construction along with keeping gabions and slabs on the way to landslide from Sherpa village to Ghodatabela was completed. In the next part, the trail from Langtang Khola Bridge to Rimche was more affected due to the earthquake 2015, so stair construction work was completed to make the trekking trail safe from landslide and flood. In another part, the trekking trail from Ghodatabela to Kyanjin Gompa was maintained and the village destroyed by the avalanche was also managed and maintainence of trekking trail was completed. Similarly, the trial was made widely opened as well as stairs were constructed between landslide and Bamboo. The project was successfully implemented by Trekking Agencies’ Association of Nepal (TAAN) and was supported by Langtang Management and Reconstruction Committee (LMRC). The project has been completed successfully with integration of five contract team. TAAN First Vice President Tej Bahadur Gurung is coordinator and Human Resource In-charge Machhindra Acharya is the correspondence for this project. DAV member, an Austrian citizen Gunnar Amor was the project leader and coordinator. He is a hydropower engineer by his profession. In the program, DAV German Alpine Club Vice President Mr. Jurgen Epple, Public Relations officer Mrs. Andrea Haendel, Project Leader Mr. Gunnar Amor, DAV Summit Club Managing Director Mr. Manfred Lorenz along with other eight Journalists from different renowned german media were also present during the ceremony. Similarly, TAAN General Secretary Mr. Karna Bahadur Lama, Human Resource Manager Machhindra Acharya, Finance Officer Sushil Raj Khatri, Communication Officer Subina Manandhar along with photographer and videographer were present in the program. The Vice President of DAV Summit and General Secretary of TAAN Karna Lama inaugurated the program. The program eventuated through the adoration of the Lamas (Holy man). TAAN General Secretary Karna Bahadur Lama said “The contribution of DAV plays a vital role for augmentation of tourism industry. 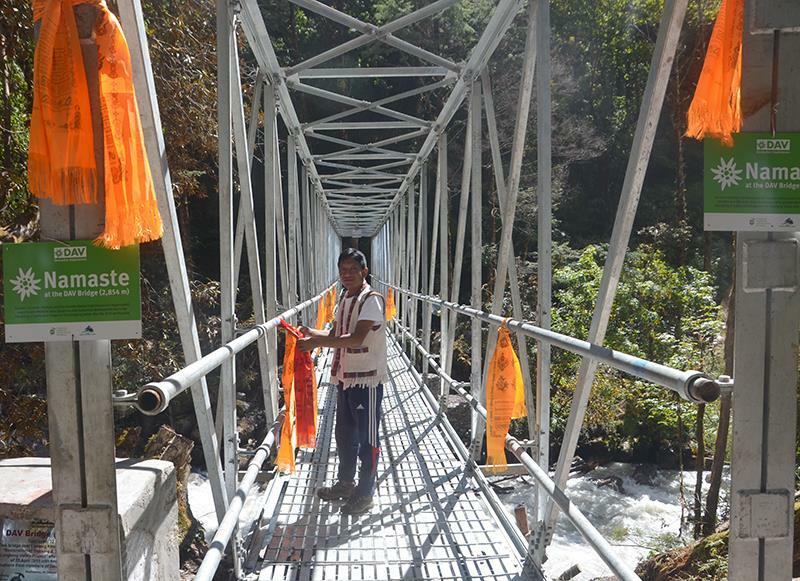 The bridge constructed will help the trekkers as well as local people to hike and carriage in a safe way.” Before, there was a wooden bridge which was risky for transport but now, due to the construction of DAV Bridge it has been more secure for the local people and visitor to travel. He added. TAAN First Vice- President Tej Bahadur said that “Langtang region being a popular destination, after the 2015 earthquake was one of the most affected regions of Nepal. Due to which tourism industry was diminished. To start the tourism business in this region TAAN has done several things to convey positive message in the market. 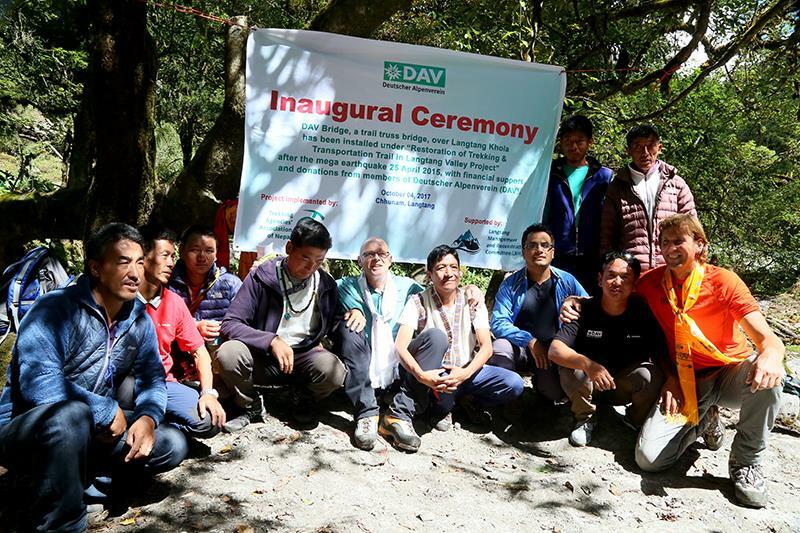 The construction of DAV Bridge and trekking trail maintenance will exaggerate the tourism market in Langtang Valley.” On behalf of TAAN he showed his gratitude towards the contribution made by DAV and its members. He thanked International Trekkers, representative of DAV in Nepal and LMRC for their support for the successful completion of the project. The Vice President Jurgen Epple said that Germany has a good relationship with Nepal since a long time. When they heard the news about 2015 earthquake, they were eager to help Nepal. They are very happy to know that their contribution has gone to the right place for the social welfare. Bridge is so important for the local people as well as tourist. The infrastructure in the whole Langtnag Valley from Syabru Bensi to the DVA Bridge and up to Langtang Village has now largely been renovated and trekking tourism has started again. This has helped to foster tourism business and also indicates safety for the visit. 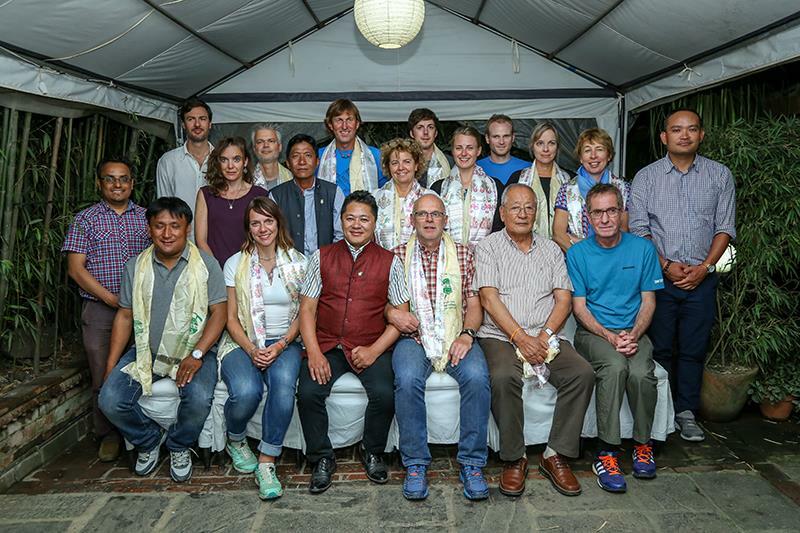 He thanked Trekking Agencies’ Association of Nepal for the support to complete the project successfully.